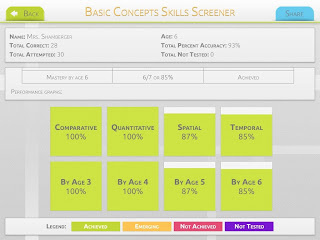 Smarty Ears Apps has a new app out that helps to screen basic concepts. 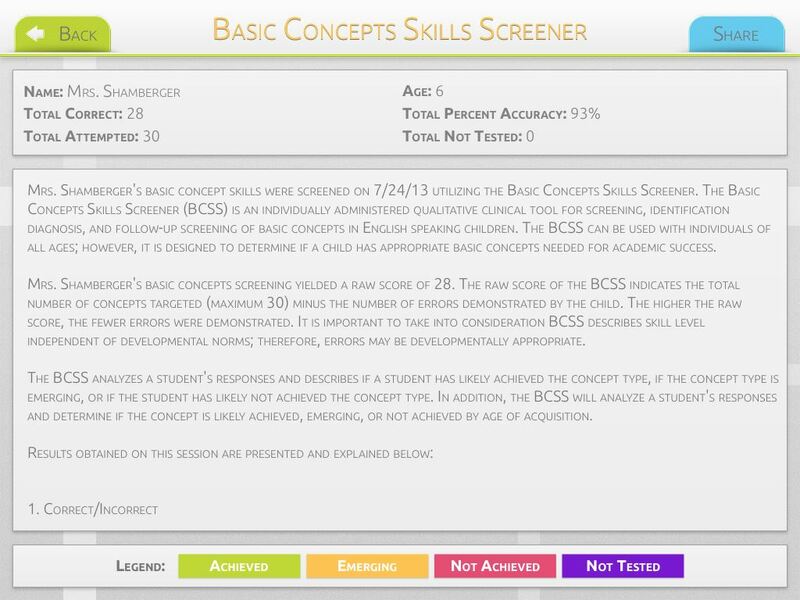 It is called...Basic Concepts Skill Screener. 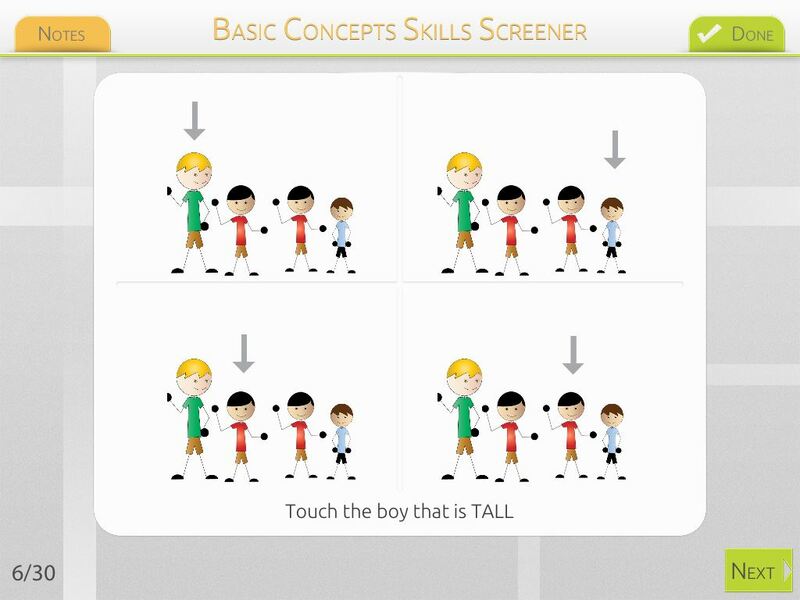 This is a great new app that was developed for the purpose of evaluating and describing the basic concepts skills of children at the receptive level. It is individually administered so that you can establish a baseline of basic concepts that are in error. There are two options for this screener: Full Screening (79 items) and Quick Screening (30 items). The administration time for the full screener is 10-15 minutes, while the quick screening takes about 5 minutes. My five year old son took the quick screening and finished in about five minutes. He was starting to get a little distracted toward the end though, so I would guess that he would need a little break while doing the full screener. To begin, you enter the student's name and date of birth. 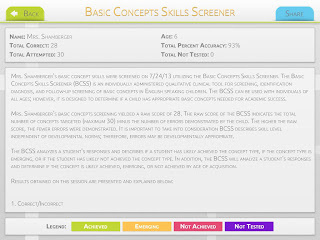 Then, you select the student and decide if you will administer the full screening or the quick screening. Then, the screener begins. The app presents a request for the student to touch a picture depicting a particular concept from a choice of four pictures. 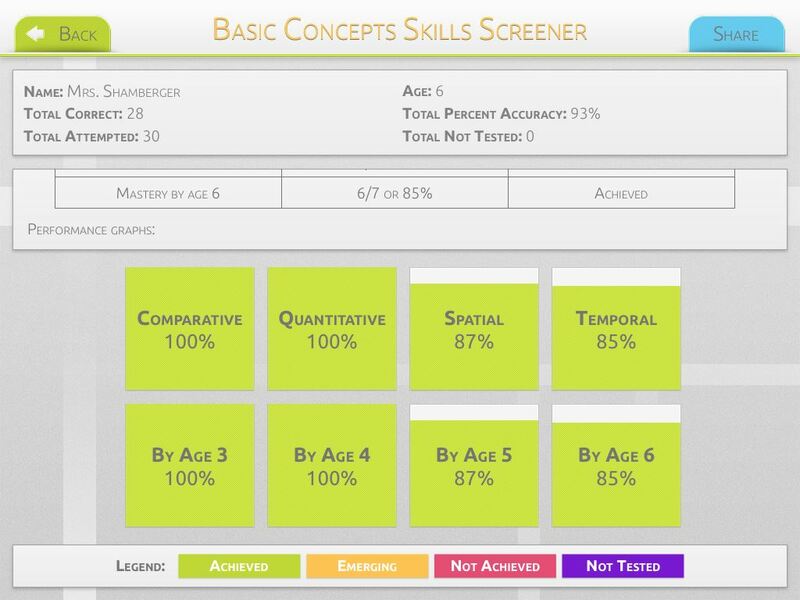 There are four basic areas of concepts that are assessed in this screener. These items all look at the location of an item. Terms include above, on, off, bottom, between, through, under, corner, etc. These items focus on quantity. Terms include words like whole, all, empty, most, never, etc. These terms focus on the relationship between items such as size, color, texture, and weight. Terms include words like tall, dark, cold, think, sad, etc. These terms indicate how events are related in time. Terms include words like first, next, starting, second, etc. When your student is finished, you press the done button, and the app returns you to the student page. From there, you can select "see report" to get a pretty detailed report of the student's results. The results from the session are reported three different ways. 1)You get to see the correct/incorrect items by concept. 2) The data is broken down by concept type (i.e., comparative, quantitative, spatial, and temporal). 3) Data is also reported by age of acquisition. This area provides a performance graph that is color coded. I think that this can give you some great baseline data when working on basic concepts. I know that I will be administering this to many of my younger students this fall. I like that it is simple to use and understand for the student. I also love the variety of ways that data is presented to you when the session is completed. What could improve this app? My son did not really understand the tally of questions remaining in the session. It is reported as #of completed items/30 (or 79 for the full screener). I think he would understand a more visual representation of how many items are left. You can purchase this app at the iTunes store $9.99 HERE. You can enter to win a copy in the rafflecopter giveaway below!